I wouldn't go all-in on making him a physical threat - that take skips out on representing his cunning, which is sort of a bummer. Maybe “Best Laid Plans” off Zemo would be a good fit? I don't know how well this fits here but that 'cunning' comment got me thinking about creating a power that negatively effects your opponent strategy rather then physical attributes. Immediately after an opponent reveals a numbered Order Marker on a card they control, you may reveal the "X" Order Marker on this card and choose a figure your opponent controls without a revealed Order Marker on their card. Your opponent may not take any turns with the chosen figure's card during this player turn. So the basic idea here is that you can disrupt bonding chains and limit your opponents option if able to bond with more than one figure. Batman can't bond with Robin this turn, Luke Cage can't bond with Iron Fist but can bond with Moon Knight or Jewel, Nightwing can't activate Starfire with his Titans Go! power but the rest of his team is still fair game, etc. In the case of Nightwing, you can counter it a bit by first taking a turn with Starfire before activating Titan's Go on OM2 or 3, that way she also has a revealed OM on her card. That’s a really neat power! I don’t think it fits on Maestro, only because he is mainly a Hulk foe and Hulk doesn’t do too much bonding, but it definitely belongs in the game somewhere. Was thinking you could tweak the idea such that it prevents you from taking a turn with the figure you just revealed the OM on, but then your opponent would be able to take a turn with some other figure they control. Immediately after an opponent reveals a numbered Order Marker on a card they control, you may reveal the "X" Order Marker on this card. If you do, your opponent must move the just revealed Order Marker to another card they control, if possible, and take a turn with that figure as though they had revealed that Order Marker on their card. So your opponent has Hulk and Black Widow left in their army, Hulk is engaged with your 1 life Thanos while Black Widow in engaged with a full life Cheetah. After your opponent reveals an Order Marker on the Hulk's card, you reveal the X on your card, your opponent then moves the revealed OM to Black Widow's card and takes a turn with her, ensuring Thanos survives to attack Hulk with your next OM reveal. More thoughts on Nova later, but I always thought of the New Warriors as Reckless/Enthusiastic Crime Fighters. Hey Ronin, did you have any other thoughts on Nova? That's definitely the right kind of power for him, I think. Oh shoot, right. I've only read a little bit of 'young Nova' stuff, but the Speed Force style auto-wounding on Human Rocket stuck out to me. Is it supposed to be like that sort of 'super speed swipes' sort of thing, or more of a 'slamming into people' power? Well darn, I was really hoping you knew more about him than I did. I do think you have a point; a big body slam feels more like Rich to me than a bunch of quick swipes. I agree, this is a great fit. Although I would say Maestro is unique enough to warrant some kind of variation on the power. I'm sure there's no shortage of cheap slime/ooze miniatures that could be painted black. 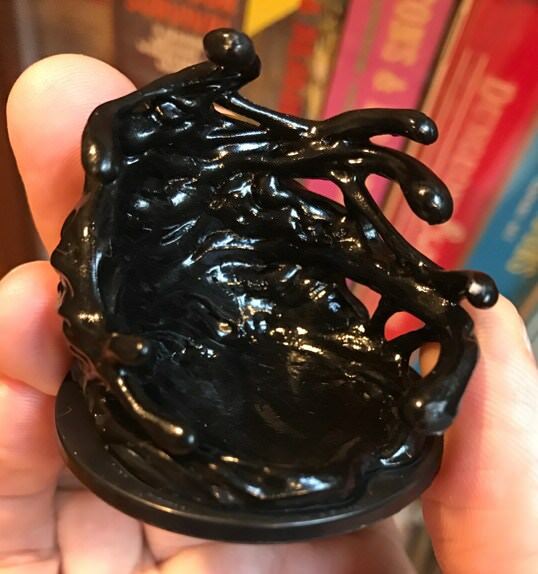 There's a really cool D&D Black Pudding mini that would work great - it actually has a slot for you to put minis into, to represent being "engulfed." Think it's like $10 though. I just got an email from CoolStuffInc, and this miniature is on sale today only! Here's a link for anyone interested. Before attacking with a normal attack against a figure without the Insane personality, you must first roll the 20-sided die. • If you roll 1, attack normally. • If you roll 2-14, add one automatic skull to whatever is rolled. • If you roll 15-19, add one automatic skull to whatever is rolled and subtract one shield from whatever is rolled by the defending figure. • If you roll 20, the targeted figure cannot roll defense dice. When rolling defense against a figure in clear sight of Midnighter without the Insane personality, all blanks rolled count as additional shields and if Midnighter is adjacent to the attacking figure, all excess shields rolled count as unblockable hits on the attacking figure. After taking a turn with Midnighter, remove 1 Wound Marker from this Army Card. Here's one I've been thinking on a bit and think could be a fun start to adding Stormwatch/The Authority. The idea would be to use Operative as the class for Stormwatch folks so potential synergy could happen down the line. Operative is already being reserved for Alpha Flight. I think it's cool if two similar groups from different universes can share synergy, but some might disagree.